A twin pack of BOSS Plain Cotton Sneaker Socks – casual sports socks given the same care and attention that their ‘everyday’ socks receive – made with the finest, combed cotton blend, with polyamide and elastane for fit and durability. 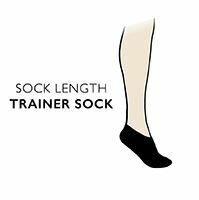 These socks feature extra reinforcement on high-wear areas such as toes and heels. They also benefit from handlinked toes for smooth seams and a gentler pressure-free top band. The BOSS brand name is represented by a woven logo in contrasting colour on the cuff band.